I have a rule at my house for mealtimes with the kids. There must always be at least one fresh vegetable on the plate—and it doesn’t have to be green! 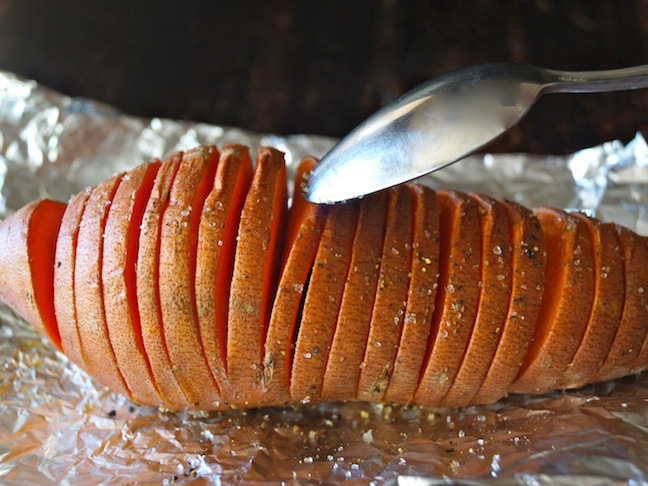 It’s not very often both my kids like the same foods, but they both love sweet potatoes, and I love how many easy ways there are to prepare them. Since it’s one of those rare veggies that my kids love, I’ve pared down my sweet potato repertoire to the three easiest, tastiest ways to cook them. Our absolute favorite way to eat them is quickly cooked in the microwave—it only takes six minutes—then mashed and mixed with smoky bacon, caramelized onions, and Hidden Valley Original Ranch flavored dressings. There are thirteen flavors to choose from, and I love the Honey BBQ for these. 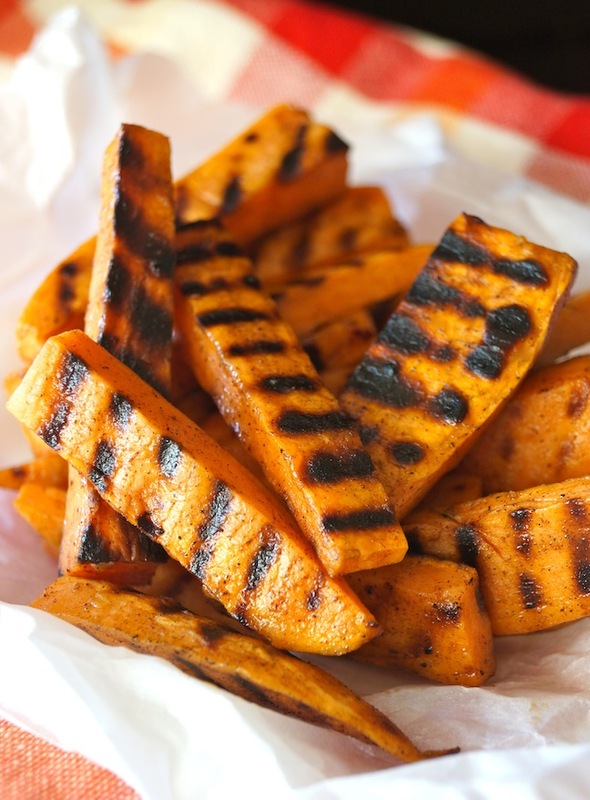 It’s also super easy to cook sweet potatoes in the oven, and during the warmer months, we love them hot off the grill—in the form of French fries. 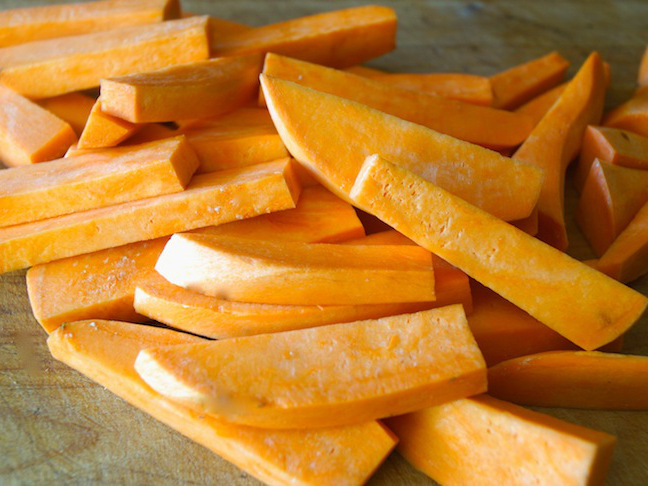 Read on for the easiest and tastiest ways to cook sweet potatoes. Step 1: Place a double layer of paper towels on a plate and set aside. Add the bacon to a small sauté pan and cook over medium heat until crispy, about 3 minutes per side. Remove the bacon from the pan and place on the towel-lined plate to drain. Add the onions to the same pan without cleaning it first. Over medium heat, stirring often, caramelize the onions for about 5 minutes. Season to taste with salt and pepper. Then crumble the drained bacon and add it to the onions. Set aside. 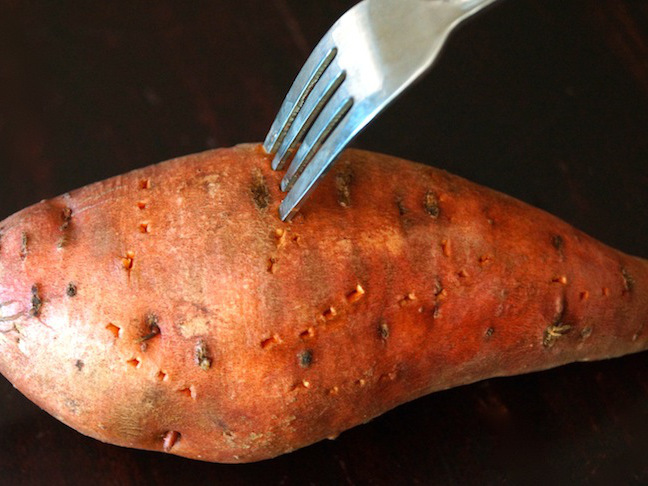 Step 2: Use a fork to pierce holes all over the sweet potatoes. Step 3: Place a double layer of paper towels in the microwave, and put the pierced sweet potatoes on top. Step 5: Slice the sweet potatoes in half, lengthwise, and then gently scoop the flesh into a mixing bowl, keeping the skin as intact as possible. 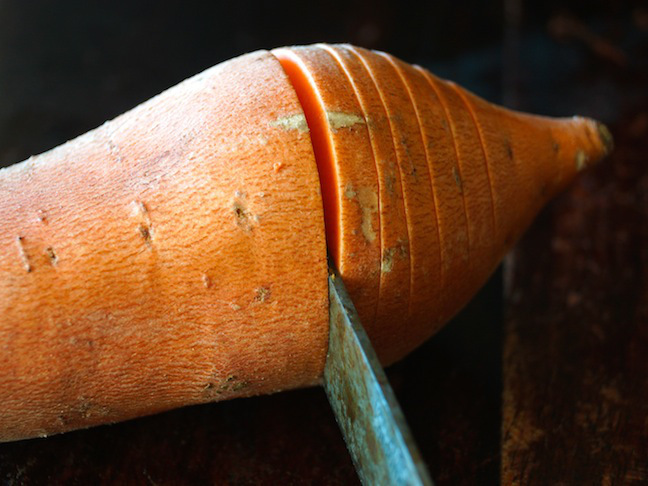 Use a fork to roughly mash the sweet potatoes. 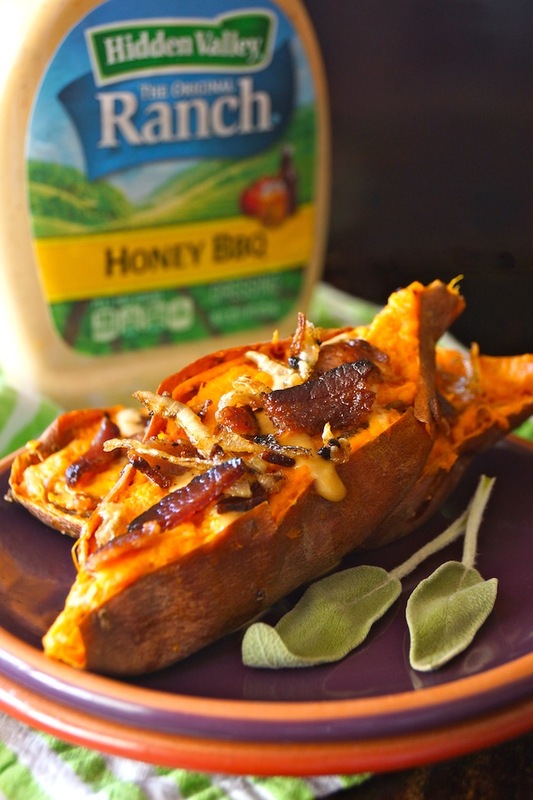 Step 6: Add the Hidden Valley Honey BBQ Original Ranch and about half of the onion-bacon mixture to the sweet potatoes and season to taste if necessary with salt and pepper. Step 7: Gently fill the empty sweet potato skins, drizzle a bit more dressing over them, and then top each one with the remaining onion-bacon mixture. Step 1: Preheat the oven to 425 degrees F. Make ⅛- to ¼-inch slits, horizontally, along the entire length of each potato, slicing almost to the bottom but being careful not to go all the way through. Step 2: Rub about half of the oil on each sweet potato. Sprinkle both with salt and pepper and place them on heavy-duty foil in the preheated 425 degree F oven. Step 3: Roast for 20 minutes and then run a spoon gently across the top to separate the slices a bit. Step 4: Continue to roast until the potatoes are tender and the outside appears slightly crispy, about 20 more minutes. Step 5: Divide the cheese slices between the two potatoes, adding one inside each slit. The slices of cheese should be slightly larger than the slits. 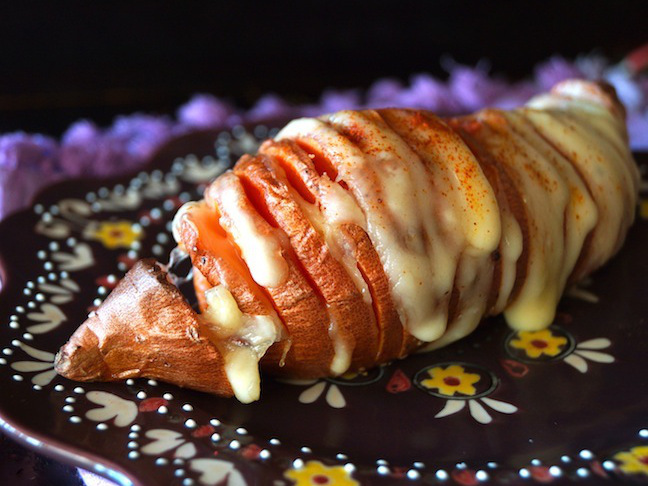 Step 6: Return the cheese-filled sweet potatoes to the oven, just to melt the cheese, about 2 minutes. Step 1: Preheat a stove-top grill or outdoor barbecue. 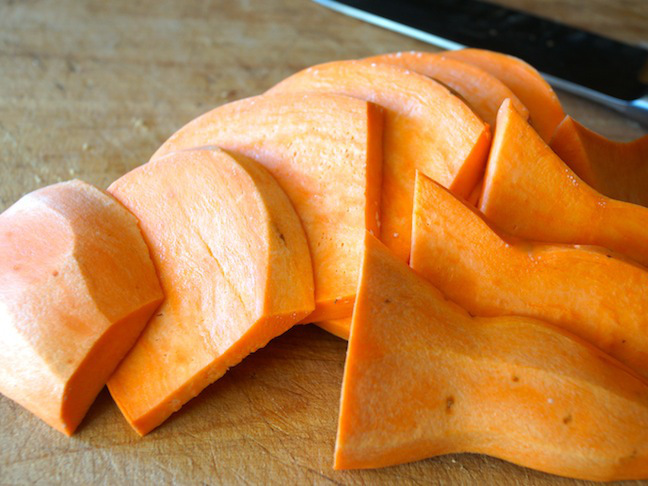 Step 2: Cut the sweet potatoes in half horizontally, and then into approximately ¼-inch slices. Step 3: Then cut those slices into fries, ¼ to ½ inch wide. Step 4: Add slices to a mixing bowl and gently toss with the olive oil, cinnamon, salt, cayenne, and brown sugar. Step 6: Season with a bit more salt if necessary and serve!